The pictures say it all: sun, sea, and… soup! Enjoy! Marseille is a fabulous city. Glad you’re getting some sun, and soup! I would say Marseilles too, that’s what a thought reading "sun, sea, and… soup!". Looks like mulligatawny to me :}hope it’s yum! It’s Marseille!!!! Je t’aime….I lived there for four months last year for school and by far the best time of my life!!! 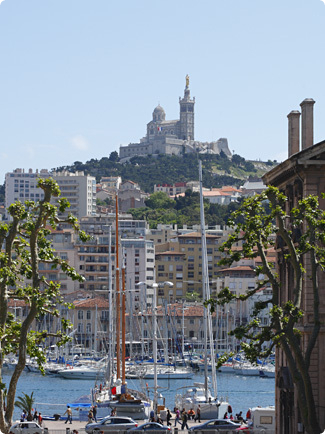 Its Marseille! I just came back from a three weeks holiday! The weather is superb! You have to visit Palais Longchamp as well! I believe Marseilles as well. Bon Appetit-une bonne soup me plait beaucoup! i guessed it was Marseille just from reading the title… Even if we all are wrong, it still looks like you have a lot of factors to make it a great plave where to be! I miss the sea so much. That soup is one of the most appetizing soups I have ever seen! I think it has something to do with the color. And I can say that the soup is really thick and has a powerful taste! I just thought the soup looked yummy! 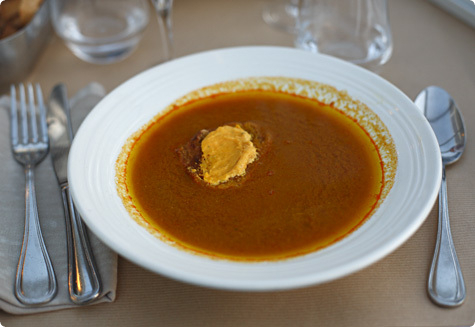 is that a bouaillabaisse or is that a soupe de poisson with a little rouille on that crouton? either way, mmmmmmmmm. don’t forget the moules et frites! Lovely pics! Is it Marseille?? ?